FitDeck is a custom deck of playing cards that makes exercise more simple, convenient and fun by constantly create new and exciting workouts. FitDeck produces and sells workout training cards for those looking to change up their workout routine or find a quick, effective workout. After using HubSpot for some time, FitDeck decided to expand their web presence with a revamped website that is more appealing to their prospects and customers, incorporating an inbound marketing strategy, and improving its online store. FitDeck engages with customers through social media, videos, blog posts, and other valuable educational content. To help FitDeck achieve their business growth goals, LyntonWeb redesigned the marketing website on HubSpot with an e-commerce shop built on Magento. 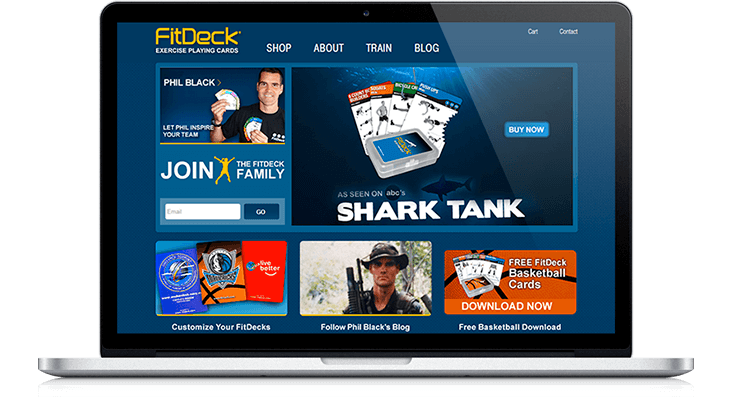 FitDeck now has an improved web presence and can release new products quickly.FitDeck was also recently featured on ABC's hit show Shark Tank and its website and ecommerce shop handled the huge increase in without any downtime or lost transactions. A testament to both the HubSpot platform and the work LyntonWeb did designing and optimizing Fitdeck's website.